Toyota has massive plans for the 2016 Chicago Auto Show, including a long list of vehicles including some race cars, specially customized show vehicles, concept cars, the newest production vehicles and interactive displays – including the opportunity to drive the new RAV4 inside of Chicago’s McCormick Place. Thanks to the sheer size of Chicago’s McCormick Place exhibition center, the Chicago Auto Show is comfortably the largest major auto show in the US. While Chicago features all of the hottest new models and concept vehicles, the available square footage allows automakers to put together some gigantic displays. At the upcoming 2016 Chicago show, Toyota looks to draw big numbers to their display with a wide variety of vehicles and activities. Of course, the Scion and Lexus brands will be on display as well, including the gorgeous new LC500 Concept, but the big news today is about the sprawling display from the Toyota brand. First up, Toyota will roll out a big group of racing and performance inspired vehicles, including a car decorated to celebrate Kyle Busch’s NASCAR Sprint Cup Championship in his #18 Toyota Camry, the rally-ready RAV4 drove by Ryan Millen in the Road America rally series and a specially decorated to recognize the partnership with Chicagoland Speedway. Also, the SEMA Edition TRD Camry and the SEMA Edition TRD Highlander will be on display after making their debuts at the Las Vegas SEMA Show. While not a performance vehicle, the Back to the Future inspired 2016 Tacoma will be on hand (shown above), designed after the old school Tacoma driven by Marty McFly in the legendary time travel series. Next up, Toyota will bring out a pair of futuristic concepts, including the i-Road 3-wheel personal electric vehicle and the FV2, which operates by the driver shifting his or her weight. Joining these unusual concepts are a handful of production vehicles decorated for different causes. 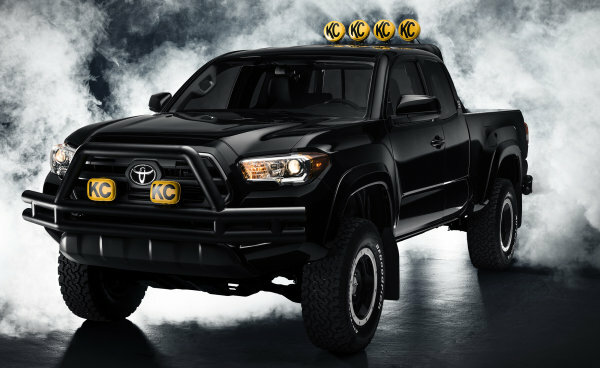 The company has teased us by saying that there will be one car decorated to recognize that the Camry is made in America, a car wrapped in the Chicago Cubs livery, another car wrapped in the Chicago White Sox livery and a vehicle designed to recognize Toyota’s “Hiring Our Heroes” program. Now for the most exciting part. There will be a trip of interactive areas in the Toyota display, including two virtual reality areas and an actual inside drive course. The virtual reality areas will offer the TeenDrive365 Distracted Driving Simulator, which offers kids and parents a chance to see the dangers of distracted driving, and the Toyota Safety Sense Simulator, which showcases the newest Toyota safety innovations. Last, but certainly not least is the RAV4 Blizzard to Beach drive, which will offer show-goers a chance to learn all about the industry’s hottest selling sport utility vehicle. Finally, this huge display will feature Toyota’s Image Machine, which is billed as “the world’s first Instagram-powered, near field communication (NFC)–enabled vending machine”. Folks who go to the show can post images to Instagram in this certain area and the vending machine will give them a free gift. There is no idea as to what kind of gift you get, but this presents a great way to encourage spectators to post pictures of Toyota, Lexus and Scion vehicles while at the Windy City show. We will be reporting from the 2016 Chicago Auto Show next week, including a good look at the many features of the Toyota display.